Festive occasions are a hectic affair, so you have to ensure that you catch up on your sleep to maintain healthy and glowing skin. one must ensure that their sleep quality improves - whether its by changing our beauty regime, bedroom, or the food you eat. ideally, we should all get at least eight hours of sleep every night, but most of us unable to. here's why its imperative to have a good night's sleep. If you have trouble sleeping at night, try going for an afternoon nap. a new study try gong varsity of British found that 90 minutes naps boosted brain function and made subjects more capable of solving problems. a power nap helps calm and mind and the muscles, thus preparing you for a hectic day ahead. studies show that ingredients like chamomiles and lemon grass drops on your pillow the fragrance will help you sleep faster. Your skin losses moisture overnight. a part from your skin feeling tight and uncomfortable, dehydration causes havoc to your skin barrier and speeds up aging, so a deep moisturizing cream is very important. however make sure that you remove all your makeup, wash your face with lukewarm water and then apply the moisturizer. this will help replenish your skin and make it supple. there ar several night masks that consist of tree silk melatonin that activate the skin's own melatonin to mimic the effects of a great sleep routine. While you're asleep .your skin goes into repair mode. a face mask with a gentle peeling action can help even the creases.while is your body is at rest, your skin works harder, as cell turnover speeds up. it's an specially good time to apply gentle resurfacing ingredients like AHAs (Alpha Hydroxy Acid) to boost the turnover of cells even more. you can also pick a fruit-based peel as well as a moisturizer to help slough away old dull cells from the surface of your skin's and reveal the radiance underneath. A good relaxing bedtime routine at a regular time is crucial. if you have trouble sleeping, a bath is one of the easiest way to start the with-off. you can add some scented oil, like the peppermint scented, to the water for a relaxing effect. We have always been told that washing the face is a necessary step in one’s daily skin care regimen. But are you doing the right way ? People usually tend to skip this step. Dirty hands mean washing your face with dirty hands. One of the most important and necessary steps is to wash your hands with antibacterial hand wash before you wash your face. The most common mistake people make while washing their face is by using soap. Harsh soaps strip the natural hydrators from the skin and make it dry and flaky. Use a face wash, instead. Ex foliating face is necessary to keep the skin glowing but doing it daily with cleansers, scrubs, and manual ex foliators makes the skin lose its shine and dull. Dermatologist suggest a cotton washcloth for ex foliation and doing it once a week is enough to keep skin healthy and glowing. All beauty manuals say hot water opens up skin pores and cold water close them. In reality, this is a just myth. The truth is that skin pores do not depend upon the type of water one uses to wash the face. Using to hot or icy cold water for washing the delicate skin can remove its natural moisture which ends up breaking the blood capillaries and making the veins visible on the face. Ideally, we should wash our face twice a day once in the morning and once in the night. Washing the face after every hour unnecessary to remove germs will lead to dry, irritated skin and can actually lead to skin producing too much oil. If one were to ask one of the most longed desires of a woman, it would be to possess a glowing skin. A student, a homemaker or a working professional every woman wants to have a radiant skin. Our fragile skin demands proper care and exposing it to harmful chemicals damages our skin. Stressful lifestyle, hectic work schedule, lack of nutrition, pollution, lack of nutritional diet, harmful sun rays (UVA/UVB) can make skin dry and dull. Although a woman cannot prevent sun tan and the hazards of pollution, she can certainly minimize the side-effects by caring for them properly. Aging is a natural process, you can look younger and glowing if you take proper care of it. No matter how ordinary this tip may sound, drinking water keeps your skin hydrated to provide you a glowing and a flawless skin. All of us are well aware of the fact that water is an essential component for the effective functioning of our body and approximately 50 to 0 percent of our body comprises of water. So drinking sufficient water cleanses off skin and removes toxins from your skin. 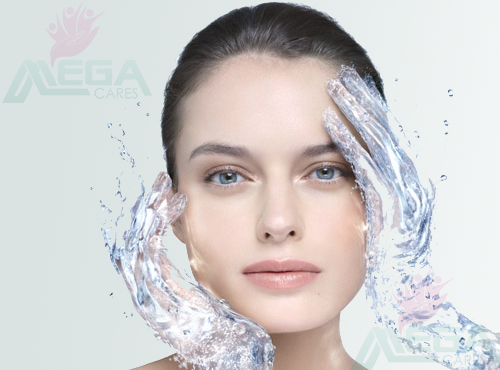 Moreover, water is also essential for maintaining the optimum skin moisture and delivers the required nutrients to the skin cells. It helps to replenish the skin and helps delay the appearance of signs of aging like ageing like wrinkles and fine lines by increasing the elasticity of the skin. As the old adage goes, “You are what you eat.” But in today’s busy life, the diet has become very faulty. We all are all well aware of the fact that nutrition plays a pivotal role in keeping us healthy. But interestingly, eating healthy doesn’t only help in keeping you healthy, but it also helps in keeping your skin fresh and glowing. It affects our body, appearance and our skin. The best way to get a glowing skin is by eating a variety of superfoods. Food that contains Vitamin C is a powerful super food and an antioxidant. It maintains your immune system and helps you in giving a radiant skin. Thankfully, getting Vitamin C rich food from your local market isn’t a tedious task either! Go eat blueberries, papaya, strawberries, kiwi etc and get the skin that you have desired for so long. One more easy way to include this into your diet is by mixing these blueberries with yogurt. Apart from this, you can also eat food which is high on healthy fats such as avocado, nuts and seeds. Although there are a plethora of skin creams available in the market today that claims to make your skin glow, it is very important not to get misled by those options and choose cautiously. First of all choosing the right kind of sun screen is extremely important to avoid tanning of your skin. Whenever opting for a sun screen, make sure to pick one with SPF 15 or higher that ensures UVB protection. The SPF factor tells you how effective the sunscreen is in preventing the sunburn caused by harmful UVB rays. You can also try using masks as it is a great way to provide your skin, the much-needed hydration. It penetrates deep into the skin to draw excess oils and it also clears away dead skin and boosts moisture. Also remember that just like the seasons, your skin changes throughout the year too. So it is not essential that what works in winter would also work in summers. Thus, try using a more hydrating and intense moisturizer for the winters and a lighter one for summers. Yes all you sleeping beauties out there! This tip exclusively belongs to you. This might also sound an ordinary one, but quality of sleep really does matter. Taking minimum six hours of deep restful sleep is crucial for maintaining the beauty of your skin. Moreover, the position that you prefer while sleeping matters too. Sleeping on your stomach can harm your skin. As this position might scrunch your face and put pressure on your neck. This in turn, will result in tighter face muscles, blocked blood circulation and sagging skin. Try breaking this habit, as this habit will impact the radiance of your skin adversely. See, taking care of your skin isn’t that difficult. It’s just that you need to make sure that you do not get lost in skin care myths and over-hyped marketing speak!